But that is backdrop. Really, it is the story of a boy stumbling towards, into, and out of, an eternal, mythical forest. At first, Michael notices things in the woods around his farm, and by the river, things glimpsed only momentarily out of the corner of an eye. He's still a small boy then, and though he gets into trouble, that trouble mainly takes the form of a beating for ruining clothes while falling into mud. 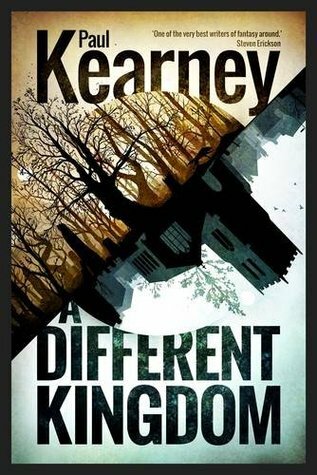 The narrative is split: we read about Michael gradually moving towards the Different Kingdom, intercut with scenes of Michael as an older man, working his way back towards Ireland / home, from that different kingdom. And then we get his journey through the kingdom, intercut with a narrative of Michael's later life in London. There are many books about characters who stumble into other worlds. Few treat the matter with as much seriousness (and thought) as A Different Kingdom. It's the sort of novel which could probably be marketed as `literary' or among the most ambitious of the fantasy genre. It's rich with themes like adolescence, first childhood sensuality, fascinations, and it treats the journey into another place as something with a real and lasting psychological impact. The prose is masterful, drifting into a rich mythical voice in the other world (and when its characters speak), but grounded in real Ireland (and later, London) when it needs to be. And the characters are complicated and believable. It's a novel reminding me of Alan Garner's work (The Weirdstone of Brisingamen, The Owl Service), and of Robert Holdstock's Mythago Wood - eminent classics. I do believe A Different Kingdom will take its place among those, and I could easily imagine it winning awards. It does not feel quite as self-conscious as Mythago Wood though: Different Kingdom is not a tale of scientists investigating myths, analysing myths, being absorbed by myths. It's a tale of a boy/man having an adventure with and through a mythical environment, which are simply treated with seriousness and respect. Its richness does mean that it commands your attention, and its narrative structure is not optimised for thrills and pace. It's a gradual, immersive novel, but definitely not a thriller. (After all, you almost always know that Michael will survive, simply because of the way the story has been intercut from different timelines). It's also a novel with a protagonist who is not always impressive. Michael the orphan boy has our undivided attention and sympathy. Michael the teenager is a bit full of himself. Michael the quest obsessed man is stubborn, wilful, and not the most cheerful company. Michael, the tired Londoner is not the hero type. It's a novel where the gradual erosion of likeability of the protagonist works against the flow: it's uphill reading. It's definitely worth persevering with, but it's not simply a cheerful little piece of escapism. Perhaps because of its complexity and less than perfect hero, this novel feels real and authentic, despite its mythical beasts and lands. Rich prose, thoughtful plotting and intelligent writing make this a worthwhile read, but also a bit of an acquired taste. I'd recommend it for fans of Alan Garner, Robert Holdstock and Jo Walton.